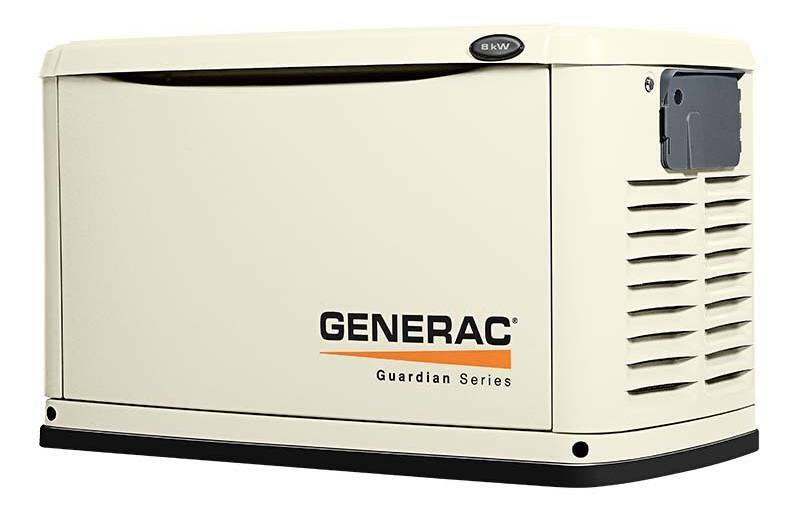 Easy Installation: When combined with a pre-wired transfer switch, re-engineered connection points, and composite mounting pad that eliminates the need for a poured concrete base (unless specified by local codes), the Guardian Series 8 kW generator is easy to install. Rated for Operation in Areas with Low Natural Gas Pressure: In areas with low natural gas pressure, the Guardian Series 8 kW generator can operate on natural gas pressures of only 3.5” of water column. All-Weather Steel Enclosure: Our durable powder-coat finish helps make the sturdy, Galvanneal steel enclosure perfect for all weather conditions. It’s also able to withstand 150 mph winds. Quick, Quiet Exercise Test: Standby generators require a short run-time periodically, known as exercise, to test and ensure the system is functioning properly and ready for an emergency. The Guardian 8 kW self-test runs for only twelve minutes. Choose your schedule - weekly, bi-weekly or monthly. 2-Line Plain Text Multilingual LCD Display: Simple user interface for ease of operation. Mode Buttons: Auto: Automatic Start on Utility failure. Programmable exerciser. Mode Buttons: Manual: Start with starter control, unit stays on. If utility fails, transfer to load takes place. Mode Buttons: Off: Stops unit. Power is removed. Control and charger still operate. Starter Lock-out: Starter cannot re-engage until 5 sec. after engine has stopped. Fuel pipe must be sized for full load. Required fuel pressure to generator fuel inlet at all load ranges - 3.5-7" water column (7-13 mm mercury) for natural gas, 10-12" water column (19-22 mm mercury) for LP gas. For Btu content, multiply ft³/hr x 2500 (LP) or ft³/hr x 1000 (NG). For Megajoule content, multiply m³/hr x 93.15 (LP) or m³/hr x 37.26 (NG). **Sound levels are taken from the front of the generator. Sound levels taken from other sides of the generator may be higher depending on installation parameters. Rating definitions - Standby: Applicable for supplying emergency power for the duration of the utility power outage. No overload capability is available for this rating. (All ratings in accordance with BS5514, ISO3046 and DIN6271). * Maximum wattage and current are subject to and limited by such factors as fuel Btu/megajoule content, ambient temperature, altitude, engine power and condition, etc. Maximum power decreases about 3.5 percent for each 1,000 feet (304.8 meters) above sea level; and also will decrease about 1 percent for each 6 °C (10 °F) above 16 °C (60 °F).